Since I don't follow football, I'm playoff agnostic. Unlike today's atheists, it means I don't know who's going; not "playoffs don't exist." The idea was to provide an example of the distinction between the terms agnostic and atheist. As I said before, this idea that one can be both an atheist and an agnostic makes no sense. Of course, not everyone who identifies as an atheist or as an agnostic believes that one can be an "agnostic atheist," but the concept has become more and more popular, even though it’s nonsense. My tweet was what I thought a simple way to demonstrate that. @comereason @HatefulAtheist @Dragonblaze | Gnosis - Greek for knowledge. Theism - belief in a personal God. Prefix "a" = without. Uh, sure. But that doesn’t solve the problem. Breaking down the prefix of the words does nothing to show how an atheist can also be an agnostic. The "without" of agnosticism doesn’t mean "without a positive belief in," it means "without any beliefs for or against." It means you either don’t know or cannot know. Either way, one cannot be an atheist and hold that God does not exist. 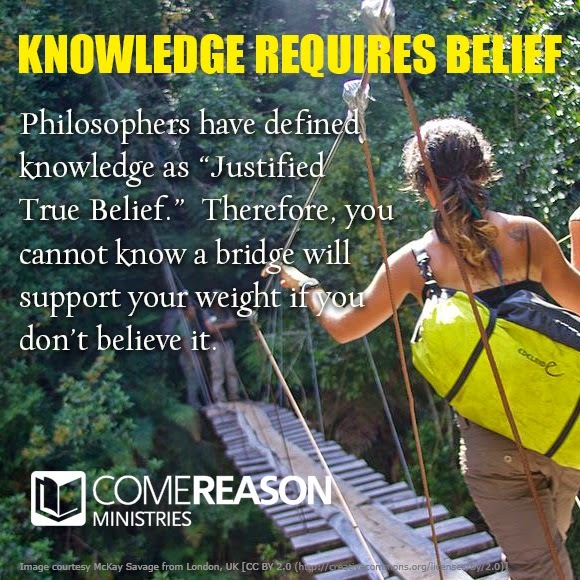 Philosophers understand that claiming to have any kind of knowledge about a thing, you must hold to some beliefs about that thing. Using my football example, if I claim to know that Team X will not make it to the Superbowl, that knowledge must be predicated on the belief that they will not be victorious in the conference final against Team Y, or something like that. If I have a belief it is either that they will win or they will lose. 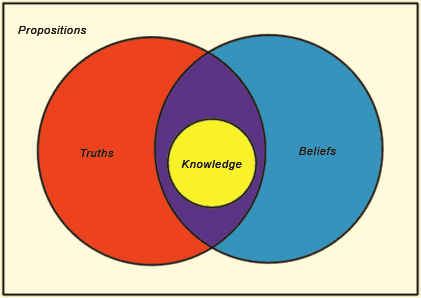 Knowledge requires that I have some kind of belief. Therefore, if one holds no beliefs, such as my neutrality regarding football playoffs, then one cannot make a claim to know about them. @atheist_fox @comereason Simply put...belief is an assumption with little merit, not needing things like facts and truth. That's confused. If you believe that your team will win the Conference finals, you may hold that belief based on their previous record, the analysis of the opposing team, and other factors. You may know know they will will, but you can certainly believe so, based on the facts. @VoloDiscere @atheist_fox @weakSquare @comereason I don't know if I have any beliefs. Hard to think of one. To which I replied: "You believe that you don't have any beliefs! That's at least one." Lenny, your twitter discussions are only with certain atheists. No one can speak for all atheists, just like no one can speak for all theists. Some atheists claim (rightly so) that they don't believe because the claim of the existence of God lies with the one making the assertion, for example, the Christian. But the evidence is insufficient to believe. I'm the type of atheist that goes even further and says traditional Christian theology can be falsified by using modern science and philosophy. I wrote about it in my booklet that is listed at Amazon.com : "Modern Science and Philosophy Destroy Christian Theology." Dr. Stenger also wrote about it: "God: The Failed Hypothesis: How Science Shows That God Does Not Exist." I completely agree that the above doesn't characterize every atheist, which is why I wrote "Of course, not everyone who identifies as an atheist or as an agnostic believes that one can be an 'agnostic atheist.'" In fact, @SecularOutpost actually agreed with me. However, in my interactions and even in blog posts and other platforms where i'm not directly involved, the view above is voiced by the majority that I come across. That's why I wrote the piece. It seems in your post, Bernie, that you use the word atheist with a person who isn't "making the assertion." But that would classify them as agnostic, not atheist. That's my point. Lenny, I think I agree with your overall view (I think) that 'atheist' is best defined as one who doesn't believe and 'agnostic' as one who isn't sure (or doesn't know). I do think those atheists that elaborate and try to explain 'agnostic atheism' are needlessly over complicating things. I agree that it is a major atheist meme that is developing among many popular atheist Facebook posters, for example. As for assertions, an atheist doesn't have to assert "there is no evidence for God." The assertion is from the Christian "that there is a God" and so the burden of proof really is upon them to justify their claim. Just like a person that asserts the aliens will attack Earth tomorrow... it is their burden of proof to prove before you shell out $10,000 to them to get a ride away from Earth on their spacecraft to flee the oncoming assault. In the same way, if a Christian says that the atheist needs to give their life to Christ to avoid the soon return of Christ and wrath of God that is imminent, they should show some evidence. And if the Mormon wants people to think Joseph Smith is a prophet (rather than con man) they better give some proof (the evidence actually shows that Smith was a con man).